It could become a series, "The Salisbury Sisters Spontaneous _______", because that's how it always seems to happen. We had been idly talking about going into the mountains this summer, but it had not happened yet. So, the conversation was maybe we'll go to Winter Park, since I'd never been there. In pictures, here is the long and scenic Sunday trip we took yesterday. It started with a stop in Idaho Springs a little after noon. Maybe we'll get some ice cream, or some chocolate. Who knows? 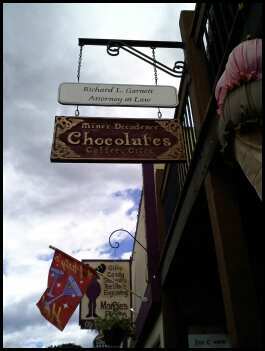 For fun and witty gifts, two shops in Idaho Springs get a shout-out: The Wild Grape and Margie's Place. Don't be surprised if your Christmas gift is purchased there. Summer in small mountain towns is not complete without stopping for fudge, taffy or ice cream. We continued up US 40 towards Winter Park, climbing 11,000+ feet over Berthoud Pass. Along the way was a waterfall sighting. After perusing lunch options in Winter Park and the towns following, we opted for the tried and true method. Which parking lot has a lot of cars? 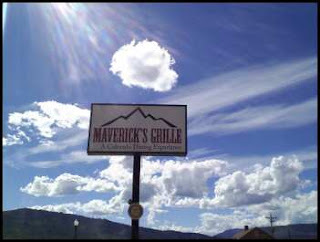 So we ate in Granby at Maverick's Grille. Maverick's has award winning guacamole. 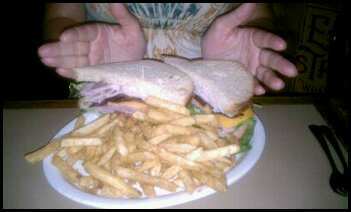 Which I enjoyed on what may now be considered the World's Biggest Club Sandwich. So big that when then brought it to the table and my eyes got wide, a guest at another table flagged the server down just to make sure that there were small sandwiches available than what was presently in front of me. We also enjoyed fried cactus and pickles. After seeing the traffic heading down towards I-70 we pondered "is there another route back to Denver that doesn't involve sitting dead still on the interstate?" The answer is yes. So continuing to explore new areas of Colorado, we headed up to Grand Lake. Colorado doesn't have a lot of big bodies of water, so Grand Lake was a beautiful sight. We stopped at the Grand Lake Lodge, home of "Colorado's Favorite Front Porch" to take in the views. We continued on into Rocky Mountain National Park. It was late afternoon so we had hopes of seeing wildlife. We lucked out with a moose sighting in one of the meadows. The moose was far away, enjoying nature, so I have no pictures. So, in smaller wildlife news, we saw a very cute chipmunk. At the viewpoint on Trail Ridge Road we saw the most amazing rainbow! The last stop on our trip was Estes Park. EP may have more ice cream and fudge stores per capita than any other touristy town in Colorado. I do love the cookie sandwiches at Grandma's Mountain Cookies, but enjoyed the coffee and ambiance at the Longs Peak Coffee and Paper House.